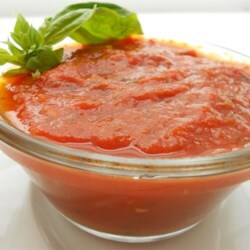 Awesome easy sauce, easy enough that I don't ever use a sauce from a jar anymore, I always keep all ingredients, in the pantry for a double batch, to go with homemade meatballs. This always gets rave reviews when I serve it. Make sure to use stewed tomatoes, since they have the cooked flavor and the onion and peppers cooked in, just regular canned tomatoes will not have this cooked flavor, which is the key to this having that long cooked flavor, without cooking it all day.